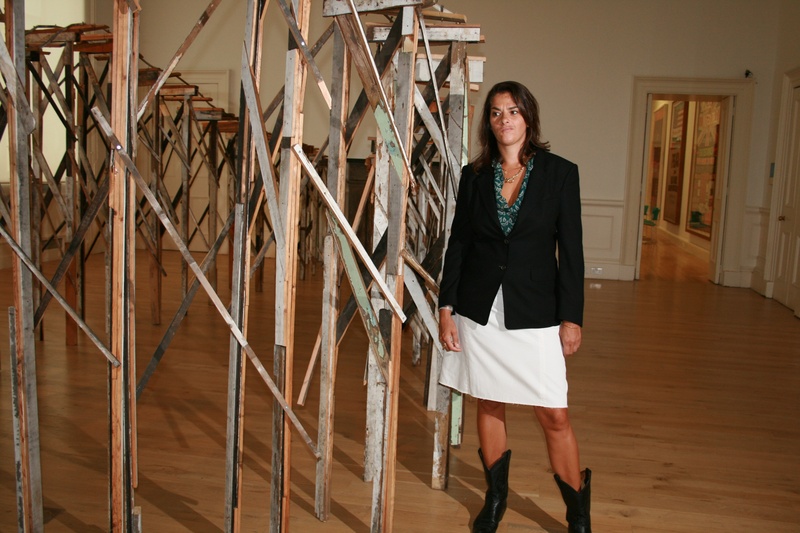 ContemporaryArtETC.com meets Tracy Emin – Contemporary Art ETC….. Contemporary Art ETCs’ Sarah Wilson met Tracy Emin at the recent press launch of the artists first retrospective at the Scottish National Gallery of Modern Art in Edinburgh. If you have never heard of Tracey Emin where on earth have you been hiding. Emin happily posed for photographs at the Press View and after a quick race through the exhibition there was a questions and answers in the room with her tapestries hanging in huge frames. We were introduced to Simon Groom the director of the gallery and Patrick Elliot, the curator. She talked about the logistics of hanging such a huge collection – it is an exhibition that has been 4 years in the planning (they were putting the finishing touched to it as we arrived), work had to be acquired from private collectors across the globe and shipped to Edinburgh. The gallery had supplied her with a model of the gallery space so she could work out the best overview of the layout – she kept the model and now stores buttons in it! She said that the course she did in philosophy was the best training she could have done for her art – as they are all about her ideas – I asked her about her plans for the meercats she made for the London plinth – she laughed and said that it was a bit of a joke really, she likes meercats and didnt expect her idea to be one of the final ones chosen she was glad it didnt win as she did not want to be remembered as the meercat woman and anyway, large sculptures scare her! And there was me believing the spiel that had accompanied the idea, that meercats are lookouts and would protect the city etc – she just likes meercats! Tracy Emin 20 Years continues at Scottish National Gallery of Modern Art in Edinburgh until November 20th.